In the same way that I wish broccoli tasted like chocolate, I also wish that cleaning was as enjoyable as relaxing on the beach. I know there are some people that don't mind it, but I'm just not one of them. Don't get me wrong, I love it when my house is spotless and sparkling clean, I just don't want to put in the time and effort to get it that way. When it comes to our hardwood floor, I find a traditional mop and bucket just a little too... slimy for me. Having to ring something out in dirty water and have it drip all over? No, thanks. So at some point we invested in one of those cleaning systems, you know the one, where we are supposed to attach the disposable pads over and over, but I'm not really a big fan of that either. How many of those pads do I actually end up using each time? And do they have to cost that much? Well, now there's a better way. Thanks to O-Cedar and their new O-Cedar ProMist Wet or Dry Floor Cleaning System, our floors have never been more efficiently, eco-friendly or easily cleaned. Light enough that both of my kids could easily push it around, the ProMist actually stands over 4' tall so it can be used by all heights and no one will have to bend or hunch to move it. More than that though, I really like the simple and thoughtful features that O-Cedar included when creating this cleaner. The removable, refillable bottle pops in and out of its holster just by pulling on it and can be filled with whatever solution you prefer. From plain water to a store-bought liquid or one that you create yourself, just pour it right in and pop the bottle back into place. 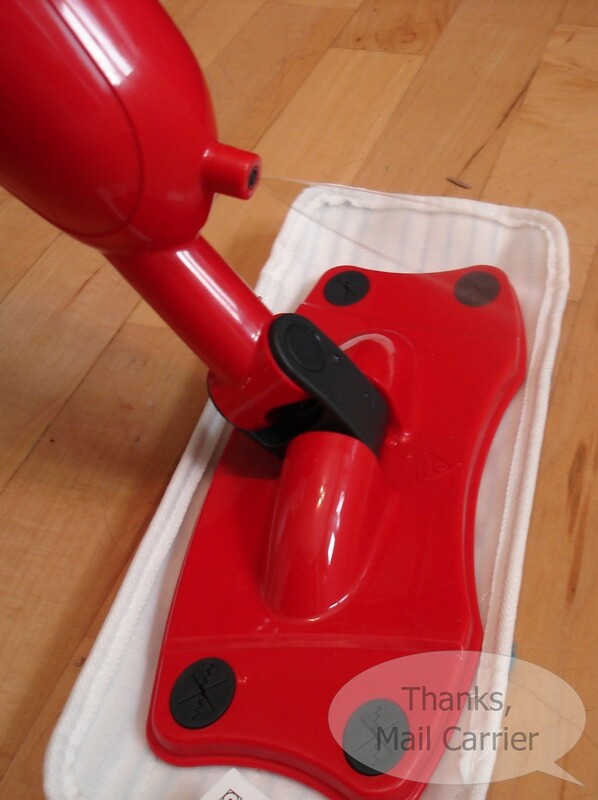 Located right on the handle of the ProMist is the trigger to squeeze to conveniently spray a nice, thick mist of that liquid right out in front to cut down on your overall cleaning time. 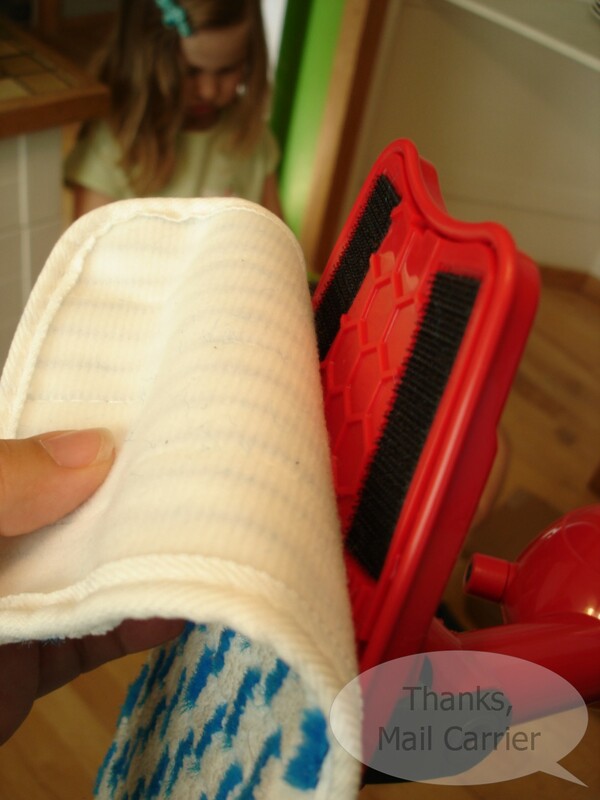 There are two different cleaning pads included with the ProMist. First, and great for everyday use, a durable, reusable microfiber pad (shown with the blue markings in the picture at left) that is designed to lift and trap dirt and grime that can be washed up to 100 times - saving both money and the environment. Or, for more messy spills (or ones that might possibly stain) the ProMist can also be used with convenient, thinner, semi-disposable pads that can also be washed or just thrown away. I really like how easy it is to attach and detach the pads, as they hold strong to the Velcro on the bottom and don't require me to do anything more than just press the cleaner down on top. 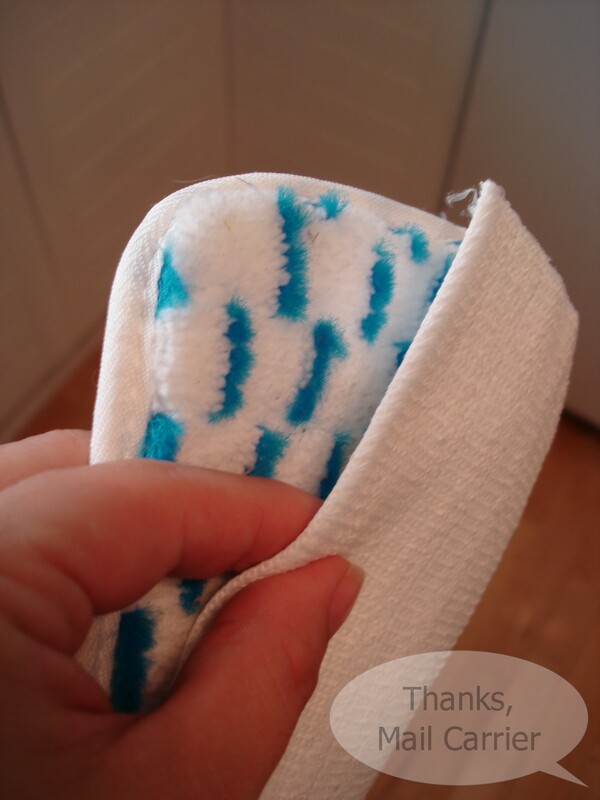 When I'm done, I easily peel the pad right off and toss it into the washing machine and store the base in the closet. Simple! O-Cedar's marketing slogan is "O-Cedar Makes Your Life Easier!" 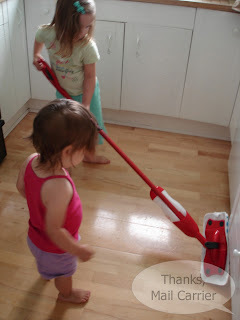 and their ProMist Wet or Dry Floor Cleaning System has done just that in our house. Big or small, this system makes clean-ups easier and quicker and there will no longer be any concerns over potentially harmful chemicals on your floors that might not be safe for your children or pets. For a quality product from a brand known for their competitively priced, hard-working items, the O-Cedar ProMist is coming soon to retailers across the country. And who knows? 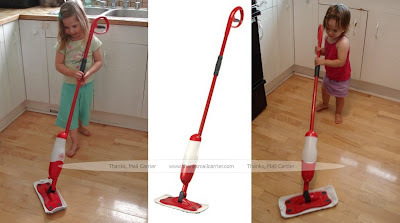 If you bring one into your home, you just might have eager little workers ready to scrub your floors shiny clean as well! I love how the girls are helping you. I need one of these for my home. We have wood floors in almost every room. Thanks for the review and sweet pictures, as always! I would love to get one of these! I'm visiting from Welcome Wednesday. I already follow you. Hi! I'm your newest follower from Welcome Wednesday!!! :) Congrats on being in the spotlight! I've been looking for something like this that I can fill with my own solution. I like that the pads are reusable too. Now I need one of these! It sure beats scrubbing the floor on my hands and knees. Your little girls are absolutely adorable! By the way, do you have a work permit for those cuties? Gosh, I wish this item was also a giveaway. I broke my swiffer last month while I was cleaning our wood floors and now I need a replacement! 'O-Cedar'...throw me a lifeline, please?? ?